He sees the infrastructure portfolio growing to at least Rs 40,000 crore by March 2015. And if growth returns to the economy, the infrastructure business has plenty of potential to grow big. 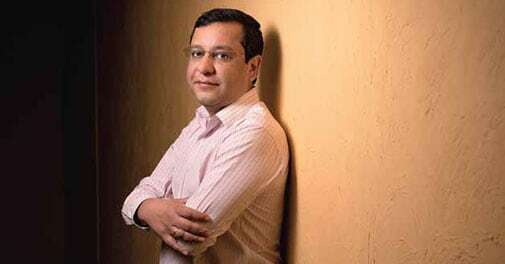 Fresh out of an MBA programme in the US around 14 years ago, Amit Goenka, the younger son of media mogul Subhash Chandra, was wondering what to do next. He wasn't keen on a career in his family's flourishing media business. "I thought, why not do something different from what is happening in the group," says Goenka, who trained under his father for few months. He wanted to be an entrepreneur in a completely new area of business - technology. Back then, the technology revolution was transforming the world, and many were writing obituaries of brick-and-mortar businesses. New-economy businesses were hogging the limelight. But Chandra, who has launched many new businesses, was not terribly excited. "If you want me to fund it, my investment committee will look at your proposal," he told his son. Also read: Passing the BatonSo it was left to Goenka to make a success of it. He slogged away, making presentations to angel investors and even large business houses, but had little success. "The group eventually agreed to fund it," he says. Perhaps it was Chandra's way of introducing his younger son to the world of business. Goenka started Cyquator, a web hosting and e-solutions company, in early 2001. A year later, it launched its services, with big plans to expand to several cities within the country. But destiny sent his plans awry, as the dotcom bubble burst. "We had no option but to downsize," says Goenka. He adds with a grin: "We were stuck with one data centre, which is even profitable today." Despite the dotcom bust, Cyquator changed the course of Goenka's life. He learned a lot in terms of building a business in start-up mode - lessons he would not have had if he had got into an existing business with multiple operations, big offices and a large workforce. "We made certain mistakes, like being top-heavy in a start-up kind of model," admits Goenka. That drove up costs. When the slowdown affected expansion plans, he had to scale down operations, and it wasn't easy. "We had to reduce staff strength overnight," he says. Chandra persuaded his son to join the group. As it happened, the CEO of Zee Learn, a fledgling venture that focused on interactive learning systems, parted ways, leaving the organisation of more than 1,000 people without a senior executive. Chandra suggested to his son: "Why don't you look after Zee Learn, as an interim arrangement?" So Goenka's entry into Zee Learn was more a matter of chance than passion. But, of course, there was something about the business that interested him. "The e-learning aspect of education was exciting," he recalls. He was involved in Zee Learn for around eight months, ending August 2002, he says. He then moved to another area of the group - the lottery business. Playwin, the company that runs this business, was launched in March 2002. Goenka moved there in September that year. "It interested me," he says of the technology-led business, which was conceptualised by his father. "The idea was to see how to get beyond lottery retail outlets - how do we launch gaming and lottery on other platforms such as Internet and mobile," he says. The sailing quickly got rough, however. Playwin's entire core team soon left and joined the competition. Many big corporate houses were making plans to enter the lottery business. "Our main technical team quit overnight. We had to make sure we continued on our growth path," says Goenka. His entry into the lottery business coincided with the building up of momentum in the economy. Playwin began to grow. "At that time, the growth was very high," he says. "The organisation didn't have the bandwith to do anything beyond that." It attempted to acquire a technology company in US, but without success. Finally, it decided to develop technology in-house. "Today, Playwin runs on its own system," says Goenka. "It is completely in-house, from the point-of-sale application to mobile to Internet." Today, Playwin is the only surviving corporate entity in the lottery business. Goenka recalls that the company notched revenue of Rs 650 crore in the first year. By the fifth year, the figure was a little over Rs 3,400 crore. However, by 2009/10, several states banned lotteries, and Playwin's presence dwindled from 14 states to five today. Many of the states that shut down lotteries were large revenue generators - Haryana, Karnataka, Kerala, Tamil Nadu, and West Bengal. "Some states raised taxes so high that it was unviable to operate," he says. Looking back, he says, a possible reason for the lottery bans could be the increased media focus on them. "We brought lotteries into such a limelight that the states realised this needs to be curbed," he says. "Lotteries are a business that always invites ethical and moral questioning from society at large. It is highly political." He then moved on to the utilities business, and that is connected to the fortunes of the lottery business. After the new restrictive lottery rules in 2010, he says, "we had lots of manpower sitting idle. We had to take a decision whether to cut manpower to cut losses, or start something new by using the same skill set." That's how the power distribution business was born. "The sector was just opening up," he adds. Two key aspects of the power distribution business are to cut power losses due to technical reasons or theft, and to improve billing and collection. Goenka says: "We upgrade distribution infrastructure to cut losses. We go door to door for billing collection." The huge potential in the distribution business becomes evident if one looks at the combined losses of state electricity boards, which totalled Rs 80,000 crore in 2012/13. Goenka, who was doing well with the utilities business, took on a much bigger role last year, when he began to oversee the group's infrastructure business, Essel Infraprojects. This includes roads, solid waste management, real estate, sports complexes, and airports. The entire game plan is to look for annuity-generating projects. "We are not into EPC. We are only looking at BOT, annuity and PPP projects," he says. EPC stands for engineering, procurement and construction, BOT for build-operate-transfer, and PPP for public-private partnership. Once loans are paid off, the annuity is something which will bring in big bucks. "Our current portfolio is Rs 28,000 crore in terms of projects," says Goenka. Like his father, Goenka is focused getting a return on investment rather than expanding haphazardly. "We expect an IRR of 18 per cent. This is our threshold," he says. He sees the infrastructure portfolio growing to at least Rs 40,000 crore by March 2015. And if growth returns to the economy, the infrastructure business has plenty of potential to grow big. The credit goes to Chandra, who has carefully groomed his younger son to look after the non-media businesses of the group. Goenka has handled all non-media business by now - some from scratch - while elder brother Punit handles the media business. "Punit is a consensus builder, and Amit is more of a risk-taker," says Chandra.